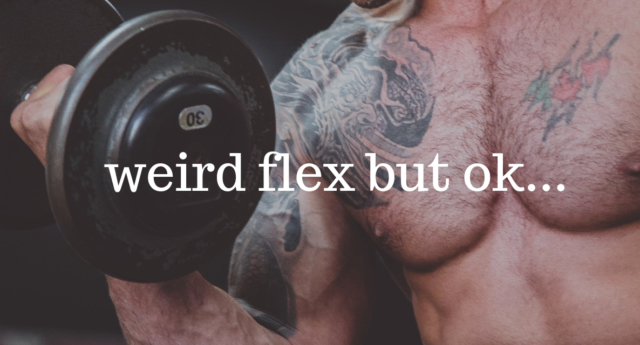 “Weird flex but OK” – this trending social media phrase can be found all over the internet. But what does it mean? Read on for the definition. Whether you’re on Twitter or Instagram, you won’t be able to escape the latest slang phrase. If you consider the literal definition of the phrase… you might imagine someone flexing their muscles in an unusual way. But, of course, it doesn’t mean that. So, what does ‘weird flex but OK’ mean? The new social media phrase “weird flex but OK” is used to respond to something deemed to be a strange boast. Essentially, it means ‘odd gloat but understandable nonetheless,’ just as the Twitter user @ilysmooky pointed out. See the screenshot below. It first appeared on Twitter on December 1, 2017, when user @finnfeighery seemingly coined the phrase. He had replied to a tweet posted by Malala, the youngest Nobel Peace Prize winner. Malala had written a tweet summarising her achievements in 2017—she spoke of the UN, her honorary Canadian citizenship, passing her exams, getting accepted into Oxford University and more. Finn Feighery simply replied, “weird flex but ok.” See the screenshot below. However, online users have gone on to use the phrase to respond to pretty much anything—even if it isn’t a boast by definition. Viral ‘weird flex but ok’ meme. Are you a fan of The Sixth Sense? What do you think of this meme? So far, Shafeeq’s hilarious response to the New York Post‘s tweet has received 78,000 retweets and over 400,000 likes. Have you been doing the same as Adam? What is a “thot”? What does it mean and where did it come from?